By Farah Master and Donny Kwok HONG KONG (Reuters) �C Chinese venture capital and private equity funds are pouring hundreds of millions of dollars into local start-ups serving up snack food products of the healthier kind, and threatening the market share of larger Chinese and global food companies. Backed by savvy marketing and online promotions targeting the increasingly health-conscious among China’s burgeoning middle class, brands such as nuts seller Three Squirrels and Le Pur, a maker of Greek yoghurt, are nibbling away at the sales of the big corporations in the country’s more than $500 billion food and beverage industry. The start-ups are recording double and triple-digit sales growth leading to rocketing valuations as they dominate the rapidly growing online market in particular. Investment by venture capital firms in China’s food and beverage start-ups is close to doubling to nearly $2 billion over the past two years, said Wang Xiaolong, managing director of Hony Capital, one of China’s biggest private equity firms and owner of PizzaExpress, a global pizza restaurant company. “For local Chinese food and beverage brands to turn into international brands, it is only a matter of time,” Wang told Reuters, adding that the trend was unstoppable. Increasing numbers of Chinese taking up sport and exercise and a greater awareness of lifestyle diseases like obesity and diabetes has helped to accelerate the demand for healthier products, especially among the millennial generation. Scandals over tainted food in China in the past 10 years has also contributed to the trend. Local Chinese food and beverage brands are gaining in popularity as they focus not only on health benefits of their offerings but the quality of their production, said Nicholas Cator, executive director at Belgian investment firm Verlinvest, which last year set up a $300 million joint venture with Chinese state-owned conglomerate China Resources. Cator said his firm is interested in investing in brands such as Three Squirrels and Le Pur and would aim to help them with distribution, brand building and technology. “It’s heating up … branded food and beverage was lagging on the tech and healthcare valuations but valuations in F&B have been increasing,” he said. Products such as Greek yogurt, nuts and probiotic drinks have seen big gains in growth at the expense of those laden with sugar and preservatives said analysts and food company executives. Some speciality Chinese products or concepts, such as hot pot, chilli sauce and milk tea, have also recorded rising sales. Zhou Hei Ya <1458.HK>, for example, is turning braised duck into a premium snack food, emphasizing its quality. 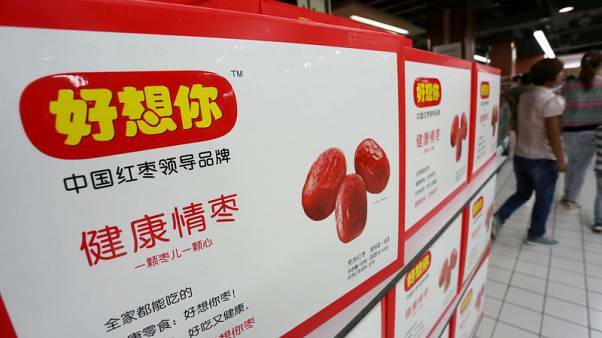 Le Pur, Three Squirrels, dried fruit and nuts company Be & Cheery, which was acquired by health food company Haoxiangni <002582.SZ> in 2016, and Zhou Hei Ya did not respond to requests for comment for this story.